As many cosmetics companies have learned the hard way, consistently producing a high-quality product is no easy feat. Just last quarter there were eight recalls for cosmetics products in the US and 20 in the EU, most for products presenting a chemical risk to consumers. And hand in hand with product quality is ensuring that each product is compliant with numerous levels of regulations before entering each unique market. Veeva’s partners at Cosmetic Compliance recently released the results of a cosmetic industry survey of 600+ industry leaders highlighting the top three compliance challenges facing cosmetic brands this year. Let’s walk through each of them and how you can set yourself, your team, and your organization up for success in 2019.
International regulations are the largest compliance challenge for cosmetic brands in 2019, with 60% of survey respondents indicated this as their largest challenge. As those in the cosmetics industry know all too well, international regulations rapidly change, which means regulatory and quality officers have to continuously stay up to date. Just last year, China announced the establishment of the State Administration for Market Regulatory (SAMR) which covers cosmetics as well as food and drugs. As the second largest cosmetics market globally, the impact of tighter safety monitoring and new cosmetics classifications is still rippling through companies operating in or seeking to enter the Chinese market. And that is just one country’s regulations to understand and comply with! Most cosmetics companies operating globally also adhere to the 2013 EU Cosmetic Directive and its strict cosmetovigilance requirements, as well as FDA regulations, other unique country and local level directives, chemical substance registration requirements, and more. Failure to comply with new regulations can result in fines ranging from $25,000 to upwards of $250,000. For smaller independent brands, fines like these can easily put them out of business. Increasingly forward-thinking companies are mitigating risks like these by adopting a single, authoritative solution for their compliance and regulatory needs, providing their companies with the agility to respond to changing regulations. Does your company have the systems in place to adequately address this regulatory challenge? If not, 2019 is the year to explore a modern solutions for managing regulatory information and processes. 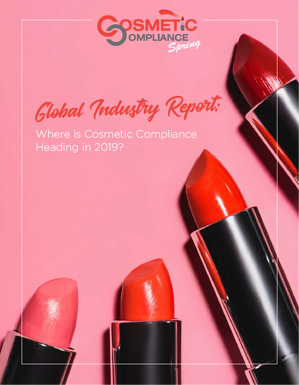 The survey found claims substantiation to be the second largest compliance challenge for cosmetic brands in 2019, with 49% of respondents indicating this challenge on a company-wide level and 52% indicating it on an individual level. Claims substantiation is a growing industry challenge due to the increasing popularity of “natural” and “organic” cosmetic products. Presently, there is no formal definition for “natural” products in cosmetics, which has increased the potential risk factor for claims. That being said, it’s difficult in today’s regulatory climate to write truthful claims supported by adequate scientific evidence with no formal definition for “natural” cosmetic products. How are product claims managed at your company today? If you're like many companies, it may be through a mix of excel files, email records, and documents stored in multiple locations. With consumers focused on cosmetic claims, an uncertain regulatory environment, and challenges increasing, it's critical to maintain tight control over claims development, substantiation, and usage. Consider implementing a claims management solution to unify the claims process and establish an all-important single source of truth. The third largest compliance challenge for cosmetic brands in 2019 is testing and ingredient requirements, with 41% of respondents indicating this challenge on a company-wide level and 39% on an individual level. This challenge can be largely attributed to the two new bills regarding testing and ingredient requirements that have come to light in recent years. The first bill, known as the bipartisan Personal Care Products Safety Act3, sponsored by Sens. Dianne Feinstein (D-CA) and Susan Collins (R-ME), would give the FDA more oversight over the industry in general. This bill would require the FDA to test at least five ingredients a year for safety; companies would have to submit their ingredient lists to the FDA; and companies would be required to report adverse events to the FDA, among other things. Sen. Orrin Hatch (R-UT) has also proposed a cosmetics safety bill, known as the FDA Cosmetic Safety and Modernization Act. While these challenges are common across cosmetic companies, they don’t have to stand in the way of bringing better products to market faster, without compromising compliance. Learn about how we’ve helped cosmetics companies with these challenges and schedule time to talk to one of Veeva’s cosmetics industry experts here. The Cosmetic Compliance Team surveyed 600+ industry leaders to uncover where cosmetic compliance is heading in 2019. The report uncovers the industry’s leading compliance challenges, priorities, investments, and much more.